This stuff works on stubborn hard to get rid of spirits. It is pretty powerful stuff, much stronger than traditional sage and sweetgrass when you are trying to clear negative spirits from a home. I highly recomend this product. Good to know! I have it on my list next time I order from LM. I just adore Tibetan incense in general - the smell is divine, and the spiritual effects are undeniable. I wouldn't try to use sweetgrass to clear a home, though. That's for after the space is already clear and you are trying to bring in blessings. I also always use a blend of herbs when fumigating in order to approach the clearing from several different angles. You may find you have better luck if you take a similar approach. Tibetan incense is nearly always a blend of herbs, which is one reason it's so effective. If you're dealing with spirits, then camphor is one substance that should be included in a fumigation blend, which can certainly include sage and other clearing herbs. But the Tibetan Ghost Purging Incense makes things easy and guesswork free! Of course you are right about the sweetgrass. I will be getting some of this to have on hand as well, so I thank you for your recommendation of the product Kittynmoon! Devi Spring wrote: Good to know! I have it on my list next time I order from LM. I just adore Tibetan incense in general - the smell is divine, and the spiritual effects are undeniable. My piece of advise is don't use Camphor if there is someone pregnant inside your household. But it's very potent when added in Chinesse wash.
Well, first off, my family and I has been struck with strong negative energies or bad juju in our house. I know I would need a reading from an AIRR member which I intend to do. 1) Smudge my entire house with smoke of Tibetan Ghost Purging Incense to get rid of any stubborn spirits that has been lurking inside our residence for years. 2) Clean or wash my entire house with Chinese Wash, Blessed Salt, and a whole 4 oz bottle of Fiery Wall of Protection Oil inside my windows. I intend to use three bottles of Chinese Wash in a five gallon bucket to make my wash more potent. 3) Then after the entire cleaning I will put Camphor squares in each corner of the house. I will also put some Fiery Wall of Protection Oil inside my windows. Thanks for any suggestions. on the wash.
By the way this is a great forum. Personally, I dont think you need to be so heavy handed with the washing products. You don't need to have 3 bottles of Chinese Wash in a 5 gallon bucket. That just seems overly obsessive. In addition, you don't need to use an entire 4 oz. bottle of Fiery Wall of Protection Oil either. You can literally use a few drops. I agree with stars, more washing products in the water does not equal better cleaning. I agree with the above posters, more is not better in the wash. Your floors will probably just get sticky. I would not put 4 oz of oil in a floorwash. Get the Fiery Wall of Protection bath salts or use just a few drops of the oil. Use the Chinese Wash as is described: 1-3 teaspoons per pail of water. If you want a really strong job, start with the Tibetan Ghost Purging Incense. Then, I would rather use a mixture of Chinese Wash, Uncrossing Bath Crystals and tea-water made from boiled 13-Herb Bath. After that, do second inward wash with Fiery Wall of Protection Bath Salts dissolved in water. Dressing the windows and the doors with Fiery Wall of Protection Oil is a great idea, and so is the use of Camphor squares in the corners. You can also burn a small white blessing candle in every room once you've cleansed it. Would the Tibetan Ghost Purging Incense would be a good start to begin with (first day of cleaning). Then secondarily wash everything with chinese wash, uncrossing crystals, 13-herb bath and bathsalt the following day. After driving everything in the front door apply FWoP in the doors and windows and light up each room with a blessing candle (could I purchase this blessing candle at LMC)? Your advices are great. Thanks to all for saving me on that sticky floor, if so, it could have been a disaster. Aldagse, we sell many types of white candles for blessing. A dozen 4" white candles will be most inexpensive, if you dress them yourself with Blessing OIl and purchase one small Star Candle Holder for use in each room. A more costly way to go would be to purchase a dressed, fixed, and prayed over Blessing Vigil Candle for each room. (In this case, the candles would be pre-dressed for you, and you would not need to order any Blessing Oil. There are also numerous choices between those: 6" candles, 9: jumbo candles, votice lights, white figural candles, etc. Basically, you can choose the colour white in any form, and dress the candle with Blessing Oil. By the way, Tibetan Ghost Purging Incense is one of our most unusual products, and is highly regarded by all who have used it in their homes. It is unique. Thanks so much cat and to every one involved like stars, turnsteel and svarnthyndan. Cat, I'll visit your store again pretty soon to buy all the supplies I need plus I need a lighting on the chapel. I have been there before and I just reside nearby (vallejo). Plus I love to be around your lovely place cause its so calm and peaceful. What is the difference between the Banishing Incense Powder made by Lucky Mojo and the Tibetan Ghost Purging Incense Powder which Lucky Mojo imports and sells? Is one more effective, easy to use, have a different purpose/outcome, etc.? What can be used to rid my home permanently of spirits that are currently there and will not leave even though they have been asked to? I don't feel they are evil spirits but I don't want any spirits in my home. The difference is cultural. One culture's magical and spiritual and religious practices may not be deemed "more effective" than another. We do not engage in religious debates here. "Large mylar packet printed in blue and silver contains Tibetan purging incense used for purification of homes from ghosts through the aid of the Blue God; blended from 40 sacred herbs, this incense powder has been prayed over by celibate nuns for 40 days. This is a highly traditional spiritual incense made by Tibetan refugees living in Taiwan." From this you can deduce that it is a product that derives from the indigenous Bon portion of Tibetan Buddhism. It removes ghosts, which are considered to be "defiling" in that religion. "To remove unwanted people or conditions; far milder than Hot Foot." 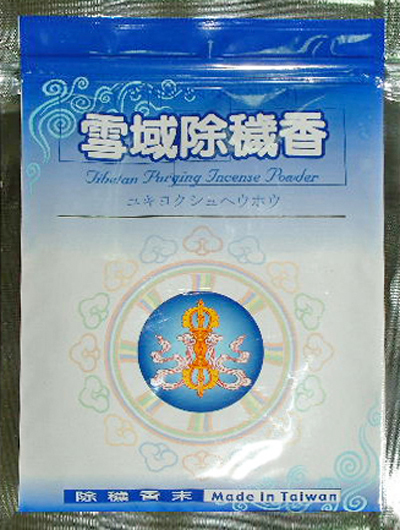 Since your desire is to remove spirits, you would want to get the Tibetan Ghost-Purging Incense Powder. 1) Is it possible to roll up the Tibetan purging incense into a cone like you can with the Lucky Mojo Banishing incense? 2) If so, can I use half and half or only a little or? 3) If not, would I be able to include some of the Tibetan Purging incense with the Lucky Mojo Banishing incense when rolling it into a cone? 4) I am trying to avoid using those charcoal disks since it appears many people have issues either getting them lit or keeping them lit. Any ideas, please? 4) I have no problem with charcoal disks and prefer them to burning loose powder incense because they lead to an even burn. I use them fresh from the wrapper and i close the wrapper around the remainder of the pack. They do not keep well in rainy weather. Think of them as something that must be stored in an air-proof container and they will be fine. Although I do not do this, it was recommended to me by a friend in the conjure community. I work and heat mine up in a different way, that I really ran across. It can actually be dangerous and pose a liability, which is why I am not willing to share the methods that I utilize. According to this friend of mine, if you store the disks in the freezer, they will work just fine if you live in an area like me. I live in Florida-- the land of humidity and where everything is a flood zone. Is there any specific Psalm that should be said when using the Tibetan ghost purging incense in cone firm? 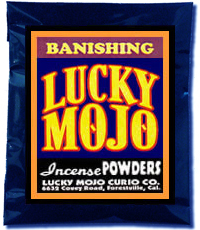 Same goes for Lucky Mojo Banishing incense. Should I also be telling the spirits that they must leave while burning either if these incenses? A number of different psalms could be helpful. An excellent link to look through them is provided by AIRR here: http://www.readersandrootworkers.org/wi ... _of_Psalms. Specifically, psalms 10, 15, 29, 40, 66, 145 may be helpful depending on what type of intervention you'll be doing. Will using Tibetan Ghost-purging incense rid the home of benevolent ghosts as well as malevolent? I want to try the Tibetan incense but i want the benevolent ghosts to stay. Any replies greatly appreciated. I use the Tibetan Ghost Purging Incense all the time (and absolutely love it). For me, it doesn't seem to chase away any good spirits in my home. At my Boveda, my ancestors are absolutely present. Now, when I do burn this incense, I usually do it at night before going to sleep (and I can feel peacefulness in my house). Then, in the daytime, I call my ancestor spirits (and other spirits). However, not sure if they've always been around or if they come when I call them. I really haven't experiemented/checked to see exactly what happens. Maybe someone else on the forum has had other experiences or more input?? Bianca70, your question is one of many that i file under the general heading, "Will my magic backfire, do what i don't want it to do, or produce bad side-effects?" Please consider that Tibetan Ghost Purging Incense Powder is made according to culturally time-tested recipes that are between 400 and 700 years old. It is compounded for specific purposes, namely to cleanse a location of defilement by spirits of disease, to subdue devils (demonic spirits)and remove obstacles, to protect from harm, to remove impurities, and to bring lasting peace and longevity at home. It is not made to "rid the home of benevolent ghosts," so there is no ground upon which to assume that it will somehow have that unfortunate side-effect, and after all these centuries of manufacture and use, if it did have a tendency to do that, i think we'd have heard about it by now. I thank you both for your replies, makes sense! . I will be ordering the Tibetan Incense. I tried ordering some by clicking on the "Add to Cart" button just now, and got the notice: "This item was not added to the cart because the SKU could not be found." Looks like the shopping cart gremlins are getting restless again. I had no problem adding this item to a shopping cart. I will consider including it in my next order. Hellow , i am from Malaysia, i and my friend got this Black magic and i want to find out what incense powder should i use to get rid of this demon in my body (very strong) and evil from the house (very strong). This Tibetan Purging Incense is perfect for the home, Jin. Just click the link above to purchase! I prefer cleansing baths for spirits that have attached themselves to a person. Try mixing Run Devil Run and Uncrossing bath crystal with a splash of Buffalo Ammonia. This forum is so helpful and this thread is exactly what I was looking for. I stumbled upon the Tibetan Ghost Purging Insence on the LM website and it's exactly what I'm looking for. I am ordering it right now. Thank you everyone for all your clear explanations and how to use it along with the Chinese wash and fiery wall of protection products. I will light a white candle in each room dressed with protection oil after I have burned the insence, washed my home and anointed my doors and windows with fiery wall of protection oil. So happy to hear this great news! You are most welcome, Ethereal48! Is the Tibetan Ghost Purging Incense self-lighting like Lucky Mojo's incenses, or is it more ideal with a charcoal tablet? Tibetan Ghost Purging Incense incense is self-lighting. awesome. thank you. i used it as on a charcoal disk, but I'll try it as i use my other condition incenses. Thank you MissMIchaele!! I have recently learned from a Tibetan that I should not use charcoal with this incense, under any circumstances. So, we learn something new everyday!! I just saw this post Miss Aida, thank you kindly for sharing!! From reading the thread I take it, this is a powered incense. What could i burn it on? 1. Do I have to open windows when using ghost purging incense like we do for sage? It is just really hot here, and takes forever to re-cool the house after burning with the windows open. 2. What is the reason the Tibetans say never to use charcoal? I hope you are on good spirits. Anytime you are purging something out of your home, you have to open your windows and (recommended) doors. The reason why is that type of energy has to go somewhere, & you want it out of your house. As for the second question, Miss Aida May know the answer to that one. I received my Tibetan Ghost Purging Incense! Excited to use it and hopefully finally rid the house of the demon which keeps attacking me. Should this be burnt at a specific time of day/day of the week or can it be used any time? Thanks for the quick reply, JayDee. I already have Ammonia and Chinese Floor Wash so will give the house another cleansing asap. I was also advised to use Run Devil Run incense to try and get rid of this stubborn demon. Would you use that before or after Tibetan Ghost Purging? Either one they both made for similar purposes. You can burn one then the other, open a window to let the evil escape. I read lots of great things about this Tibetan product im going to have to order it. Just have to add that the Tibetan Ghost Purging incense is amazing. Best thing I have found for ridding premises of an unwanted entity. (I have not personally tried Run Devil Run incense; in my particular situation it wasn't an evil entity at all, just a stubborn and very attached one causing issues...) The Tibetan Ghost Purging Incense worked immediately when cleansing alone did not do the trick. Remember to follow up with protection on your doors, windows, person etc. afterwards so the entity can't return. Thank you so much for the information on the Tibetan Ghost Purging Incense! It sounds like exactly what I need for a current situation.